Kapuso stars joined GMAKF EVP and COO Mel C. Tiangco in giving the residents an early Christmas gift last December. 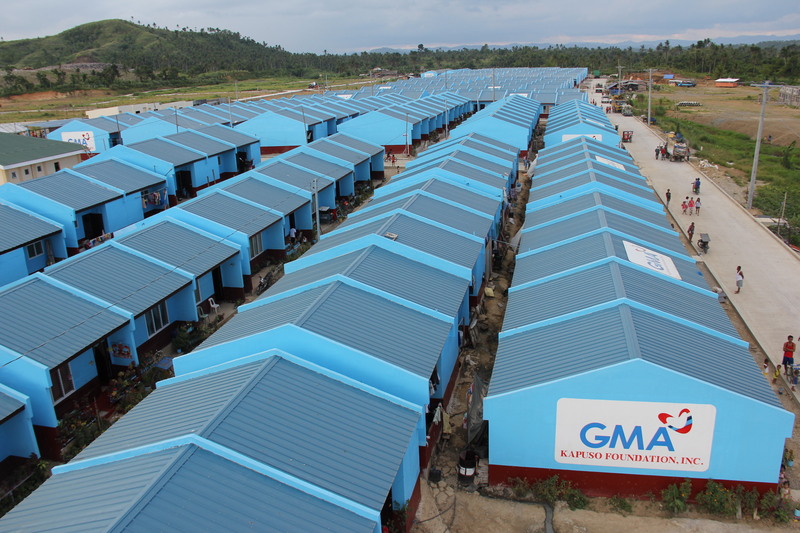 GMA Kapuso Foundation (GMAKF) recently marked another milestone achievement with the completion of its 403-unit housing project in Tacloban, Leyte. 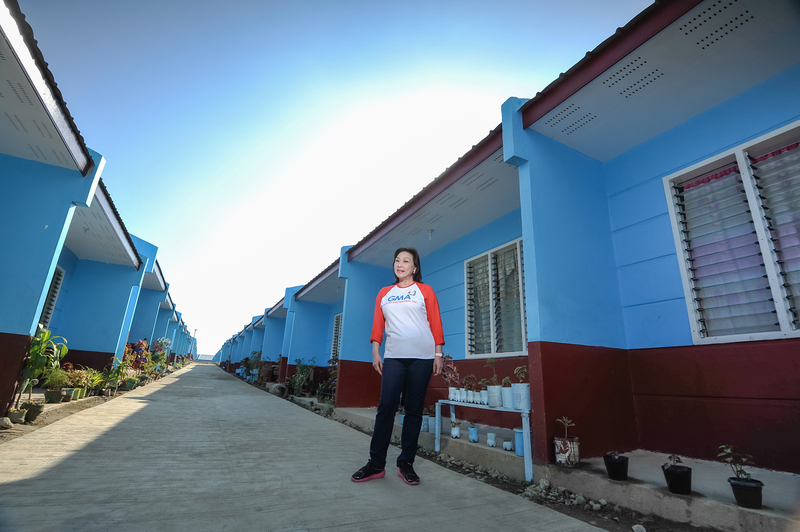 The Kapuso Village in Tacloban is the first permanent concrete housing project in the area for survivors of typhoon Yolanda. With the help of its donors and partners, GMAKF continues to reach out to the survivors and other affected people surrounding the area of Tacloban. Along with the housing project, GMAKF is planning to build 24 new classrooms under its Kapuso School Development project within the Kapuso Village in Tacloban. A Kapuso Village will also soon rise in Palo with 169 more concrete houses to further accommodate the survivors. GMAKF also requested the local government to provide an additional 2,000 square meter space for an office for the homeowners association, function hall and a multi-purpose center, where residents can set up sari-sari stores and other establishments they deem wise, to further make the area a barangay. Meanwhile, GMAKF recently formed a group of volunteers under the guidance of the Department of Community Development of the College of Social Work and Community Development in UP Diliman to help and guide the beneficiaries of the Kapuso Village in terms of having a sense of community and building camaraderie. There are currently 403 families or more than 3,000 individuals, who were left homeless by the super typhoon, who are now residing in the Kapuso Village in Tacloban. Indeed, GMAKF gives these survivors a new hope, and a new story to tell. Pope Francis’ visit to the country has been a resounding success – providing an electrifying atmosphere in the five days that he was here and winning the hearts of Filipinos not only through his words and deeds but also because of his captivating smile and sincerity that communicate directly to the soul. And just like in the past – during significant events that help shape the country’s history – more viewers nationwide trusted GMA Network as their primary source of news and information. Pope Francis’ five-day apostolic and state visit to the Philippines, from January 15 to 19, is no exception as GMA-7 and GMA News TV’s joint special “Ang People’s Pope sa Pilipinas” emerged as the most watched coverage of the said Papal visit nationwide. 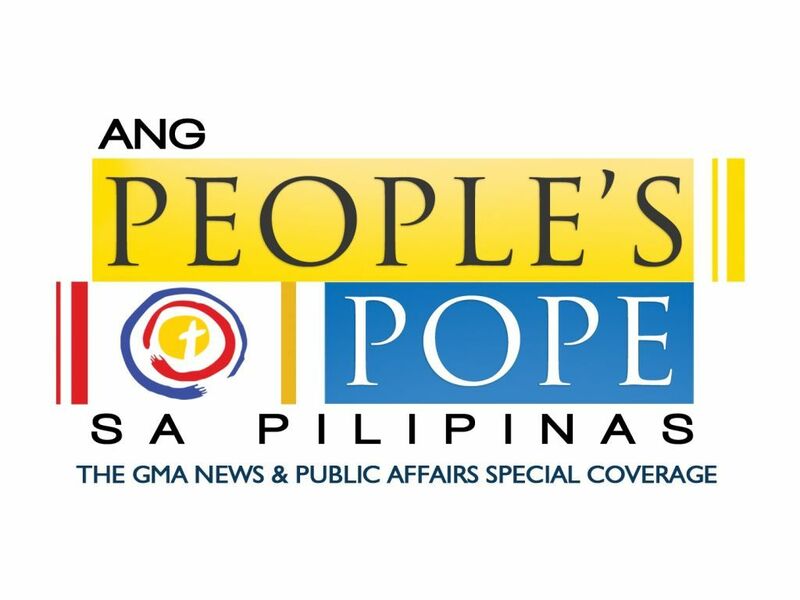 Based on household data from the industry’s widely-trusted ratings service provider Nielsen TV Audience Measurement, GMA-7’s “Ang People’s Pope sa Pilipinas” posted an average of 15% from January 15 to 19 (based on overnight ratings) in NUTAM (National Urban Television Audience Measurement). It led ABS-CBN’s11.7% by 3.3 rating points. The Kapuso Network’s special coverage, which was bannered by GMA News pillars Mel Tiangco, Mike Enriquez, Vicky Morales, Arnold Clavio, Howie Severino and Jessica Soho, together with the full roster of GMA News and Public Affairs, registered even bigger leads in the viewer-rich areas of Urban Luzon and Mega Manila. In Urban Luzon, which comprises 77% of the total urban TV households nationwide, “Ang People’s Pope sa Pilipinas” got 16.9%, very much ahead of ABS-CBN’s 10.4%. Likewise in Mega Manila, which accounts for 59% of all urban TV households in the country, the Kapuso special coverage was the most watched with18.2% versus ABS-CBN’s 9.2%. “Ang People’s Pope sa Pilipinas” special coverage started with the arrival of Pope Francis on Thursday afternoon, followed by the Pope’s activities on Friday that included the state visit to Malacañan Palace, a Eucharistic celebration at the Manila Cathedral, and a special meeting with families at the Mall of Asia Arena. On Saturday, various GMA News teams covered Pope Francis’ visit to Leyte, which was shortened due to typhoon Amang. Highlights of his Leyte visit included the Pope’s heart-touching impromptu homily at the Holy Mass held at the Daniel Z. Romualdez Airport in Tacloban. And on Sunday, “Ang People’s Pope sa Pilipinas” continued its coverage of the historic visit as Pope Francis headed a youth gathering at the University of Santo Tomas and led the record-breaking Mass celebration at the Quirino Grandstand in Luneta, which was attended by approximately six million people. “Ang People’s Pope sa Pilipinas” also joined the country as it bade farewell to Pope Francis on Monday morning. GMA Pinoy TV, the Network’s flagship international channel, aired the live coverage overseas through its carriers in the US, Canada, Middle East, North Africa and Asia-Pacific region. The Network’s special coverage, available online via GMA News Online’s official papal visit microsite(gmanews.tv/popefrancis), was also a big hit with web users. The microsite, with its liveblog, livestream, Pope Tracker, and the #BlessedByThePope section, consistently provided breaking stories and heart-warming human interest articles including that of the girl who managed to get a selfie with the Pope, the story of the father who lost a child due to an accident after the Tacloban mass, the girl who cried during the UST event, the image of the smiling Pope in the rain, and how almost everyone was moved to tears during the Tacloban mass. Moreover, GMA News’ hashtag #BlessedByThePope became a top trending topic in the Philippines and was also one of the trending topics worldwide for two consecutive days. GMA News Online was also able to get noteworthy user-generated content, both photos and videos, through YouScoop. And its “The Filipino faith is waterproof” photo was shared by thousands. The Network’s flagship AM radio station DZBB 594 kHz Super Radyo, on the other hand, also had its “Si Pope Francis sa Pilipinas” special coverage. For more information on GMA Network’s artists, programs, international channels and events, visit the websitewww.gmanetwork.com/international. Twenty years after the last papal visit in Manila, Pope Francis blessed Filipinos with his presence, his wisdom, and his empowering and comforting words that renewed and strengthened the faith of approximately 80 million Catholics in the Philippines. 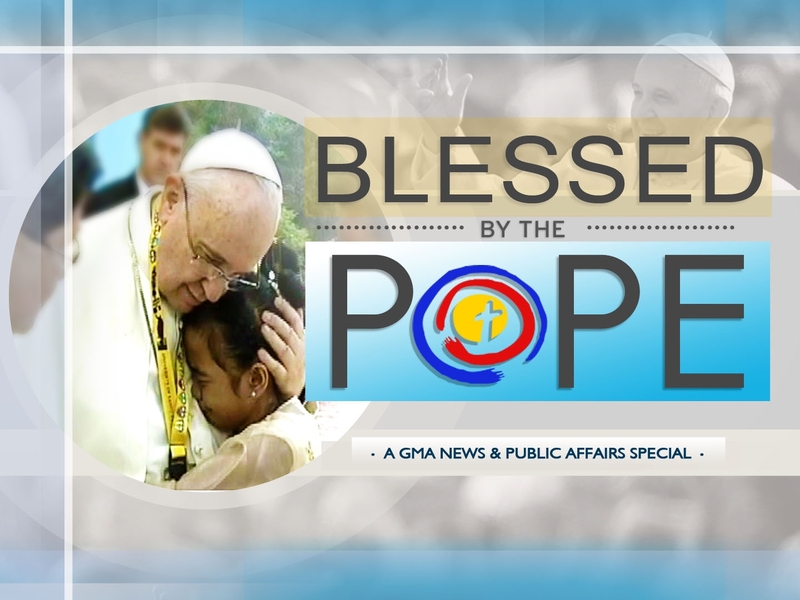 On Monday, January 26, GMA News and Public Affairs presents Blessed by the Pope, a one and a half hour special showing the highlights of Pope Francis’ historic visit – from his arrival at Villamor Air Base, to his meeting with families and the youth, to his touching trip to Leyte, to his momentous concluding mass in Luneta before record-breaking crowds, until his departure. Presented by award-winning broadcast journalist Ms. Jessica Soho, Blessed by the Pope features special interviews with the pilot who flew Pope Francis to Tacloban, the chef who cooked for the Supreme Pontiff, as well as personal insights from various individuals who encountered the Pope. Blessed by the Pope also reveals a special interview with one of the families of the Yolanda survivors who had lunch with the Pope in Leyte. The private lunch was attended by invited families who were survivors of super typhoon Yolanda and the Bohol earthquake. Relive the Pope’s inspiring messages of hope, faith, love, mercy and compassion in Blessed by the Pope, a GMA News and Public Affairs Special, premiering this Monday, January 26 on GMA Pinoy TV, with a replay on January 31. 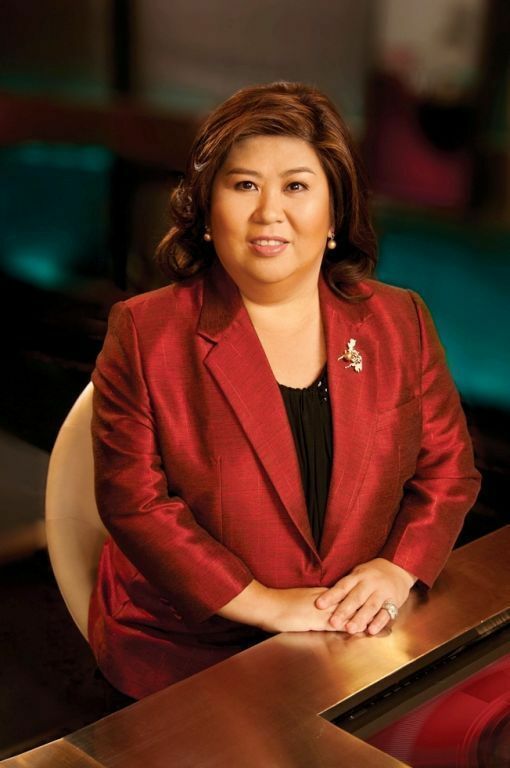 GMA Network Inc. announces the retirement of Jessica Soho after thirty (30) long years of loyal, dedicated and outstanding service as an employee and First Vice President for News Programs. Jessica has served the network well in various capacities as a News Reporter up to 1988, Production News Manager (2000), Acting News Director (2002), Vice President for News (2004), Vice President for News Programs (2008) up to her last promotion last year (2013) as First VP for News Programs. Under her leadership, GMA News became the leading and most credible broadcast news organization in the country with its premier newscast, 24 Oras ending competition’s ratings dominance shortly after it was launched in 2004. SAKSI also became an even stronger brand through the years and continues to dominate in its timeslot. Jessica also helped launch and establish all the other daily news programs on both GMA and GMA News TV as primary news sources in their time slots. “We mean it when we say, walang kinikilingan. Walang pino-protektahan. Serbisyong Totoo lamang, “ Jessica said. Jessica is home-grown in GMA. “I am a Kapuso through the core of my being. I have worked with only one (1) network throughout my entire career because I truly believe in the network’s independence and professionalism,” she adds. And although she is retiring from her news executive duties, Jessica stays on as a Kapuso talent as she continues to host her weekly primetime top-rated and award-winning news magazine programs- Kapuso Mo, Jessica Soho (KMJS) on GMA and BRIGADA on GMA News TV as well as anchor her nightly news program State of the Nation (SONA), also on GMA News TV. These programs – KMJS and SONA, recently helped win for GMA Network Inc. its fourth George Foster Peabody Award for its coverage of Typhoon Yolanda (Haiyan). SONA also recently won Silver Medal in the US International Film and TV Festival (USIFV) also for its coverage of Typhoon Yolanda. BRIGADA was given the Gold Medal and for the first time for the network and the Philippines, the much-coveted One World Medal. Jessica was also recently named Most Trusted News Presenter, for the fourth consecutive year, by Reader’s Digest. “I can never thank the network enough for everything it has given me and my family. I especially thank all my mentors- my bosses and cameramen in our old newsroom as well as my colleagues now- fellow managers, producers, reporters, talents and crews for the opportunity to lead them. It has been a great honor and privilege working with the best in the industry,” Jessica said. “Although I am retired from my position, I will always be a proud member of GMA News and Public Affairs, “ she adds. Adding to its recent string of victories in international competitions, GMA Network gained eight recognitions in the 2014 US International Film and Video Festival (USIFVF) based in Los Angeles, California. GMA’s latest win consists of two Gold Camera and five Silver Screen awards for its News and Public Affairs shows, and a Certificate of Creative Excellence for one of its Entertainment programs. Taking home golds (first place) are GMA News TV shows in the Documentary production category, namely Wagas: Mga Kuwento ng Totoong Pag-Ibig, for Docudrama programs; and Brigada, for Social Issues programs. Wagas has also been included in the shortlist of documentaries nominated for the Best of Festival (Grand Prix) Award, reserved only for the most outstanding Gold Camera recipients. Winners will be announced on June 16. The show’s entry was its “Cerebral Palsy” episode, which featured the inspiring love story of an ailing Ron Saniposo (played by Sid Lucero) and his wife Grace (portrayed by GMA Artist Center talent Gwen Zamora). Brigada’s “Gintong Krudo” episode, meanwhile, exposed the hazards faced by impoverished children at the Navotas Fish Port, who swim in filthy waters to collect spilled crude oil. The same episode also won the Silver World Medal in the 2014 New York Festival, where GMA bagged one gold, two more silvers, and three bronze world medals. Earning one of five Silver Screen awards (second place) for the network was GMA News TV’s primetime newscast, State of the Nation with Jessica Soho, in the TV News category for Continuing News Stories. The newscast was cited for its coverage of Super Typhoon Yolanda (international code name: Haiyan) last November. It was also part of GMA News and Public Affairs’ gold medal triumph at the George Foster Peabody Awards, considered the equivalent of the Pulitzer Prize for electronic media. This is the third consecutive year that State of the Nation was recognized by the USIFVF. Last year, it won the Silver Screen Award for “The Wrath of the Monsoon,” its coverage of the disastrous habagat rains that swamped Metro Manila and nearby provinces. In 2012, State of the Nation received a Certificate for Creative Excellence (third place) for its episode on the aftermath of Typhoon Sendong (international code name: Washi). For its part, Reporter’s Notebook earned a Silver Screen Award in the Documentary Programs: Current Affairs category for its “Bakas ng Trahedya” episode. Anchored by Maki Pulido and Jiggy Manicad, the episode shed light on the plight of Yolanda survivors and the government’s response in the wake of the tragedy. Reality documentary program Reel Time won two silvers for “Silang Wala sa Mapa” in the Documentary Programs: Health, Medical category, and “Dungkoy” in the Documentary Programs: Biography category. “Silang Wala sa Mapa” showed how the B’laan indigenous people of Mindanao survived for generations without modern medicine. It was also a Silver World Medal recipient in the 2014 New York Festival. “Dungkoy,” on the other hand, told the story of a nine-year-old boy who takes care of his paralyzed grandmother. Both characters share similar fates of being forsaken by their own families. GMA-7’s Front Row received a Silver Screen Award in the Documentary Programs: Social Issues category. Its winning episode, “Ulilang Lubos,” featured the plight of abandoned children who are forced to fend for themselves. Finally, family-oriented quiz show Picture! Picture! earned a Certificate for Creative Excellence for the Entertainment Program & Specials: Game Show category. Hosted by Ryan Agoncillo, Picture! Picture is an original creation of the GMA Entertainment TV group. Founded in 1967, the US International Film and Video Festival recognizes outstanding corporate, education, entertainment, documentary, and student productions. Filipinos abroad may catch Reporter’s Notebook, Wagas and Picture! Picture! on GMA Pinoy TV, while Front Row, Reel Time, State of the Nation, and Brigada airs internationally on GMA News TV International. For more details, visit http://www.gmanetwork.com/international. New York—GMA Network formally accepted the prestigious George Foster Peabody Award in New York City on Monday, May 19, for its coverage of SuperTyphoon Yolanda (Haiyan) in November 2013. GMA News and Public Affairs Senior Vice President Marissa L. Flores received the Peabody Award on behalf of the network at a ceremony at the Waldorf-Astoria in New York. Also in attendance were First Vice President for News Programs Jessica A. Soho and news anchor/reporter Jiggy Manicad, who represented the GMA News teams who covered Yolanda. GMA News and Public Affairs Senior Vice President Marissa L. Flores, First Vice President for News Programs Jessica A. Soho and news anchor/reporter Jiggy Manicad, who represented the GMA News teams who covered Yolanda. “This is for the survivors, the Filipinos and our unsinkable spirit. Philippines, Mabuhay!” Flores said after accepting the award. “Receiving this award is bittersweet for us at GMA Network because it is on the account of the suffering of Filipinos from Typhoon Haiyan or Yolanda, the strongest typhoon to have made landfall,” she added. 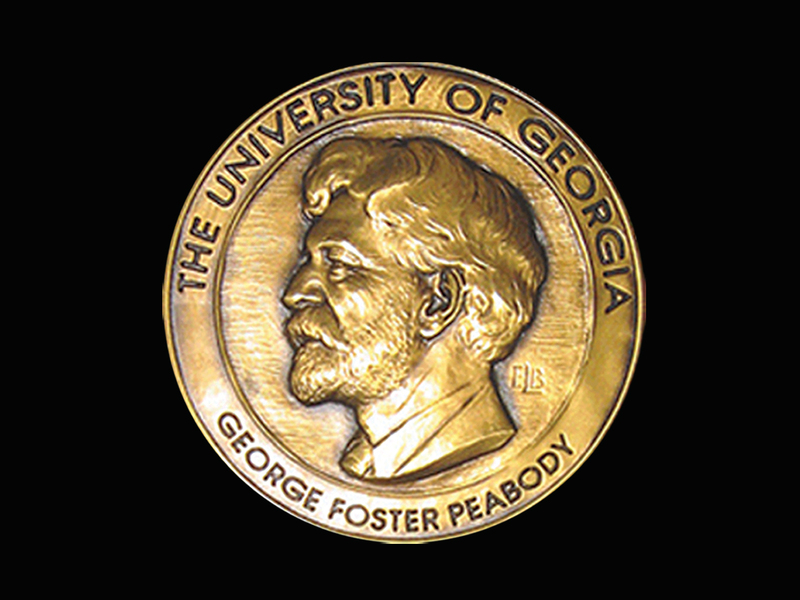 The Peabody Award is considered the broadcast equivalent of the Pulitzer Prize for print media, and the Oscar Awards for film. “Faced with daunting logistical challenges and sharing in the national shock and grief, GMA reporters and crews from State of the Nation with Jessica Soho, 24 Oras (24 Hours), Saksi (Eyewitness), 24 Oras Weekend and Kapuso Mo Jessica Soho (One at Heart, Jessica Soho) provided desperately needed spot news coverage and information, gaining strength and perspective as they worked. They followed up with solid reporting and public-service broadcasts about the aftermath, heroic acts and relief efforts. The coverage includes footage of storm-surge rapids ripping through streets and apocalyptic winds decapitating houses that’s so close-up and intense that it’s a wonder the videographers survived.” it said. The winning programs chronicled the GMA News teams’ detailed reportage of the typhoon from before it hit the Philippine area of responsibility to its unforgiving blows to the Visayas region and its painful aftermath. “We accept this with immense gratitude on behalf of the people of GMA News and Public Affairs who risked their lives to tell the story,” added Flores. 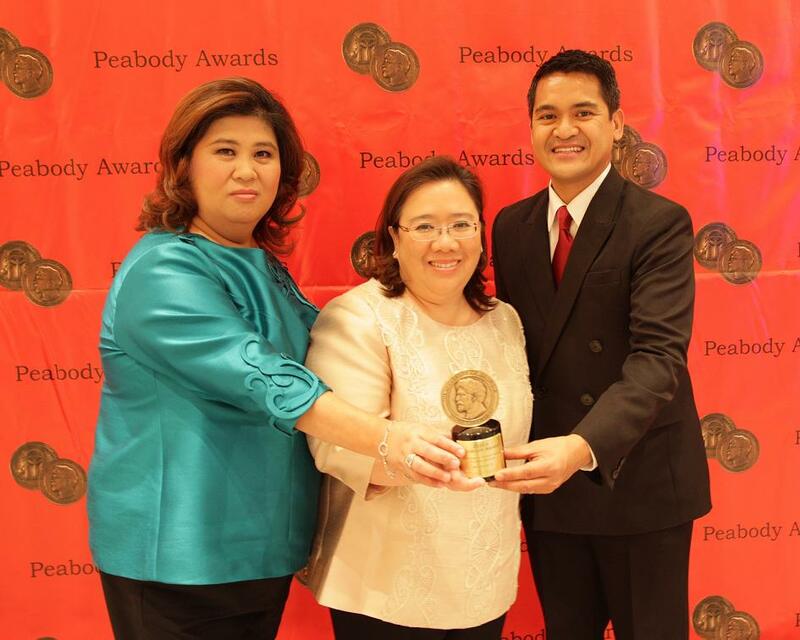 This is the fourth Peabody Award that GMA Network received on behalf of the Philippines. The network earned its first Peabody in 1999 for the I-Witness documentaries “Kidneys for Sale” and “Kamao” by Soho and for Jay Taruc’s child labor story on Brigada Siete. Kara David’s I-Witness episode “Ambulansyang de Paa” succeeded in 2010 followed by Reel Time’s “Salat” in 2013. GMA is the only news and public affairs organization in the country to have received this prestigious award for excellence in broadcast journalism. Along with GMA News in this year’s roster of winners are the series Breaking Bad, House of Cards, Orange is the New Black, three HBO documentaries, and twelve programs by the broadcaster PBS. Personalities present in the awarding ceremony included NBC anchor and special correspondent Tom Brokaw who received a personal award and Anthony Bourdain of CNN’s Anthony Bourdain: Parts Unknown. GMA News earned its fourth George Foster Peabody Award for the Network and the country for its special coverage on the assault and aftermath of super typhoon Yolanda. The GMA News coverage of typhoon Yolanda was broadcast overseas via GMA Network’s flagship international channel, GMA Pinoy TV and the international news channel, GMA News TV International. GMA news teams were reporting from all over the Visayas region on the 8th of November 2013, when the super typhoon, and the powerful storm surge that followed, took the lives of thousands in just a few minutes. In the aftermath, families were in search of the missing and surrounded by the dead. There was no food or water and no communication with the outside world. News teams were documenting the victims of the disaster even as they faced the same conditions. “Facing logistical challenges and sharing in the national shock in the face of what may have been the most powerful typhoon in history, GMA news teams provided desperately needed spot news coverage and information, gaining strength and perspective as they worked, and followed up with solid reporting on the aftermath, heroic acts and relief efforts,” cited the Peabody Awards Board. GMA News won the Peabody for its overall Typhoon Yolanda coverage which was composed of entries from the newscasts 24 Oras, 24 Oras Weekend, Saksi, State of the Nation and the public affairs magazine show Kapuso Mo, Jessica Soho. It is a precious win that the network shares with the Yolanda survivors who continue to struggle to rebuild their communities. The George Foster Peabody Awards, the broadcast and electronic media equivalent of the Pulitzer Prize, aims to recognize the stories that matter. Winning requires a unanimous vote from the 16 member board. Besides GMA News, this year’s list of winners include the series Breaking Bad, House of Cards, Orange is the New Black, three HBO documentaries, twelve programs by the broadcaster PBS and a personal award for journalist Tom Brokaw. GMA Network was first recognized by the Peabody Awards in 1999 for the I-Witness documentaries “Kidneys for Sale” and “Kamao” by Jessica Soho and Jay Taruc’s child labor story on “Brigada Siete.” Kara David’s I-Witness episode “Ambulansya de Paa” was awarded in 2010 followed by Reel Time’s “Salat” in 2013. GMA is the only news and public affairs organization in the country to have received this prestigious award for excellence in broadcast journalism. The 73rd Annual Peabody Awards ceremony will be held onMay 19 at the Waldorf-Astoria in New York City. For more news on the Kapuso Network’s programs visit the website www.gmanetwork.com/international, Facebook pages www.facebook.com/GMAPinoyTV, www.facebook.com/gmalifetv, andwww.facebook.com/gmanewsinternational, and Twitter pages @GMAPinoyTV and @GMA_LifeTV.